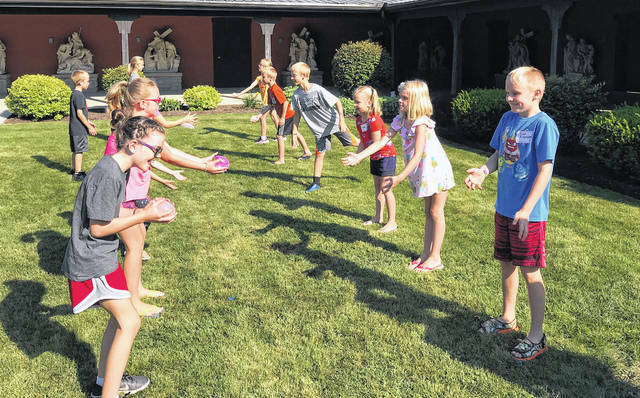 Children learn about St. Stephan’s martyrdom during a water balloon toss. MARIA STEIN – The Maria Stein Shrine of the Holy Relics hosted over 30 children for their Summer Day with the Saints on Thursday, Aug. 9. This was an opportunity for children to learn more about the communion of saints through prayer, activities, and crafts. The day began with morning prayer in the relic chapel and ended with lunch. The Maria Stein Shrine of the Holy Relics provides faith nourishment and spiritual renewal through opportunities for prayer and pilgrimage and inspiration from the lives of the saints. People from around the world visit the shrine to explore and enjoy this environment rich in holiness and history. The Shrine is located at 2291 St. John’s Road in Maria Stein. For more event information, visit www.mariasteinshrine.org.